Note the edition size of this bat... Only 108 will ever be made! This bat is not for children it is breakable and weighs about 5 pounds. Unless you have purchased one of these translucent bat from us, you have never seen a bat like this! 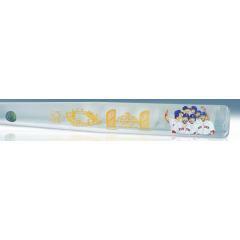 This stunning laser engraved and gold etched translucent bat is a first of its kind. The bat is engraved with an artist's rendering of Fenway Park, the Commissioner's Trophy, and the 2018 Red Sox World Series Champions logo. At the end of the barrel is a reproduction of original artwork from famed sports artist, Jolene Jessie. The bat depicts one of many celebrations from the Red Sox team this year, featuring Betts, Martinez, Benintendi, Bradley, Sale, Pearce, and Bogaerts. The bat weighs approximately 5 pounds and measures 34 inches. Due to the very limited release of this item we must charge your credit card for the full amount immediately upon receiving your order. This policy ensures we reserve a bat for you. We will confirm your order by email. Please allow 4 weeks for shipping. THE BAT IS CURRENTLY SHIPPING FOR CHRISTMAS DELIVERY SO ORDER NOW! This bat is not game used and may shatter like glass if dropped.